Designed in collaboration with Emanuela Frattini Magnusson, each pattern of The Blueprint Collection was inspired by the work of a great artist or architect. Emanuela’s vision features dramatic graphics translated into fine woven constructions and rendered in exceptionally vivid colors. 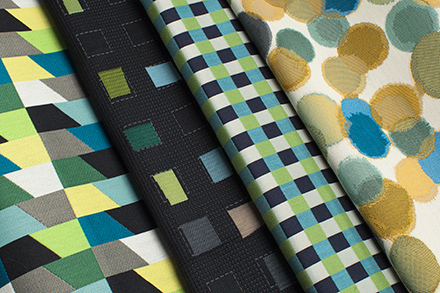 The collection features 9 patterns in 56 colors with INCASE™ fabric protection. 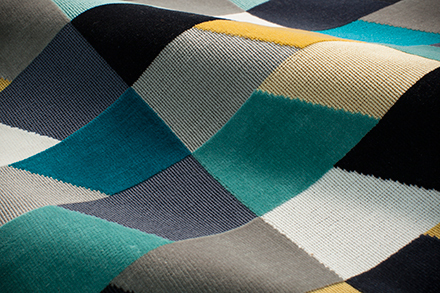 The centerpiece of the Blueprint Collection, Lucio, is a show stopping velvet woven in a cut & loop construction. 5 colors | 50,000 D.R. 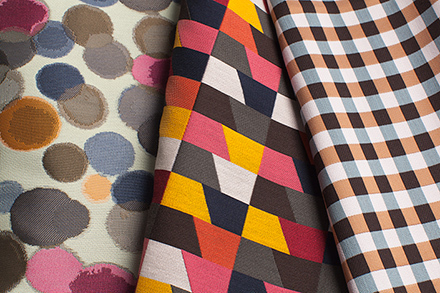 Reminiscent of a popular color reference system, Pierre features a playful pastiche of colors arranged by Emanuela. 6 colors | 150,000 D.R. The circular motif of Lloyd appears to be in motion, leaving a trail of receding and fading after images. 5 colors | 150,000 D.R. Utilizing the unique capabilities of a rare jacquard loom, Aldo boasts a massive 54” repeat bursting with color. 3 colors | 40,000 D.R. A masterpiece of complex weave structures recreates the original watercolor artwork of Emanuela’s pattern, Lina. Two layers of fabric locked together by a grid of tiny dots form a weighty fabric with exceptional texture. 5 colors | 145,000 D.R. This classic check is reinvented through Emanuela's expert juxtaposition of color and texture. 13 colors | 150,000 D.R. 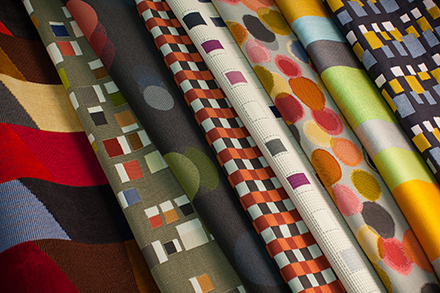 With crisp shapes and a versatile small scale motif, Carlo provides a dash of energy and color. 7 colors | 150,000 D.R. This pattern is a playful stripe composed of irregular squares and rectangles arranged in overlapping rows.